Different phases of paper productions require a stable and almost neutral pH value: this represent an important factor in order to avoid sudden pH variations in the paper machine, that may cause unstable wet end conditions. Carbon dioxide is a gas that can help the stabilisation of pH in a more precise way compared to the use of strong mineral acids. Figure 1. Ionisation of carbonic acid at different pHs. The alkaline digestion process that transforms wood into cellulosic fibres useful for tissue paper production require the use of strong pH conditions to remove lignin and other coloured substances. Extraction steps can also be coupled to oxidative reactions using oxygen or hydrogen peroxide to achieve a better breakdown and removal of lignin. The following phases of paper productions require a stable, and almost neutral pH value: this represent an important factor in order to avoid sudden pH variations in the paper machine, that may cause unstable wet end conditions. Addition of strong acids, such as sulphuric acid (H2SO4)to control pH is not advisable as the subsequent pH changes are sudden and can be difficult to control, with the result that they can affect runnability of the machine as well as the efficiency of many chemicals added to the pulp. Variations in pH are also a possible cause for breaking, since the actual value of pH – as well as the hardness of the process water determined by the concentration of free calcium ions – affect the release of the Web from solid surfaces. Alkalinity is the acid capacity, i.e. how much acid is needed to reach a certain pH level. Using CO2 for pH control preserves alkalinity, while strong acids destroy alkalinity. 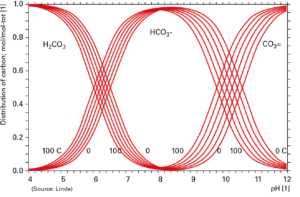 Depending on the final pH value, the use of CO2 means to change OH- negative ions to HCO3-, or 2OH- to CO32-. This change does not affect the measured alkalinity. 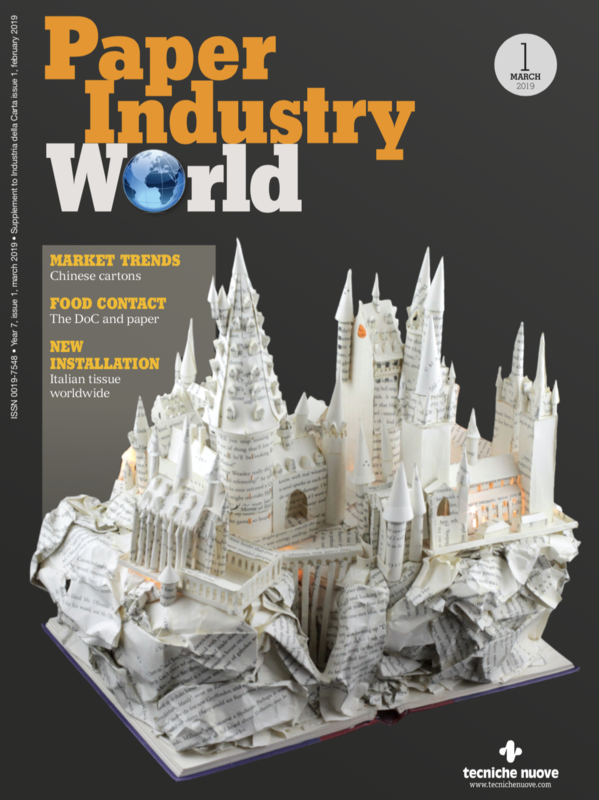 Linde presented at the Tissue World Milan its pH active control system Actico®, based only on CO2 in the gas phase, to acidify alkaline pulp or broke and to control pH in the short circulation of a paper/tissue machine. An example of this is seen in fig 2. According to Jansson, it can also be used after the alkaline boil-outs, at the wet end of paper process (figure 2). Figure 2. How CO2 stabilises pH. 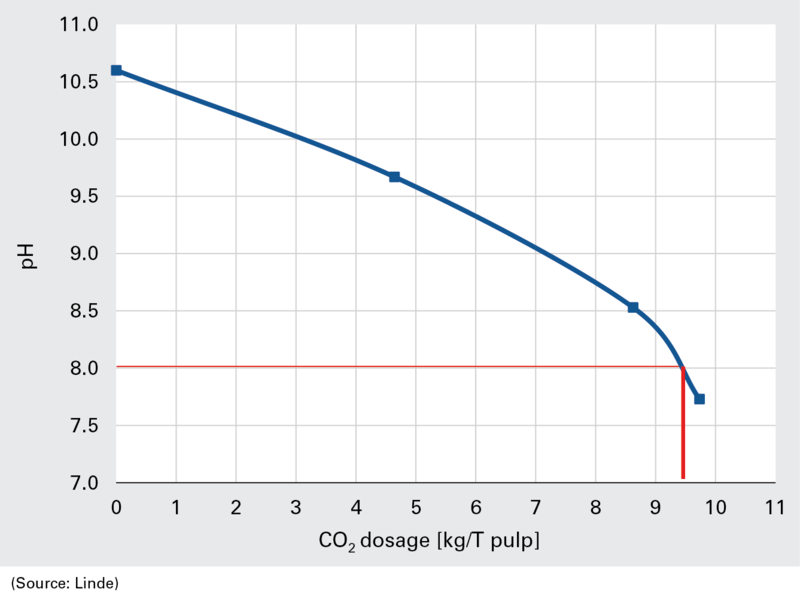 The elevated automation of the CO2 dosage can be fine tuned according to the specific needs of each paper machine. Deinked pulp, for example, contains calcium carbonate and use of strong acid dissolves some of this CaCO3. This causes pH to rise and thus more strong acid is needed to get the pH to the desired level. Since carbon dioxide does not cause a pH shock, and since its use gives more carbonates in the system, less or no CaCO3 is dissolved. As Ann-Charlotte Jansson explained, CO2 injectors and control system can be used to acidify the wet strength broke, that is usually characterised by high pH values. It is important to lower this value as the broke content affects also the tissue machine pH (figure 3). «pH varied depending on broke content in use. Also for people in the mill, having very high pH values is not good from the safety point of view», she said. 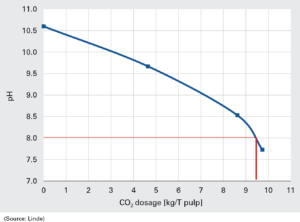 Addition of carbon dioxide with the Actico® system to acidify the alkaline pulp allows to use as much broke as needed without deteriorating the tissue machine pH, said Jansson. Linde run at first a preparatory lab pilot, to then pass to a full scale trial where the Actico® low control unit and injector regulated the optimal CO2-dosage. Figure 3. pH variation acidification of wet strength broke. Linde’s expert also explained the importance to distinguish between pH and alkalinity, the last one corresponding to the acid capacity and defined as the sum of all different ions contributing to the carbonic acid equilibrium: [HCO3–] + 2 [CO3—] + [OH–] – [H+]. Alkalinity corresponds to the amount of acid needed to reduce the pH value to a certain level, explained Jansson. «If I have a lower alkalinity, I just need few of a strong acid and the pH suddenly drops», she said. With higher alkalinity the system has a higher buffer capacity and more acid is needed to change the pH. pH stabilisation through buffering also provide the ability to increase alkalinity and prevent calcium carbonate (CaCO3) dissolution. Dissolution of calcium carbonate can cause runnability problems, formation of precipitates and deposits and a higher consumption of many chemicals. The levels of the dissolving calcium carbonate may be regulated by acting through addition of CO2 or bicarbonate ions, something that can be achieved in situ thanks to the buffering capacity of solutions containing carbon dioxide: «If pH is going down, calcium carbonate solubility increases, and you have calcium ions and bicarbonate ions in solution», said Jansson. An excess of calcium ion Ca2+ in solution is also unwanted because of the greater hardness of process water it causes, with possible formation of deposits difficult to dissolve, increased conductivity of the pulp mixture and uncontrolled formation of big CO2 bubbles. This unwanted process may also cause foaming and flotation of disturbing substances, requiring an increased dosage of defoamer or deaeretor. Excessive water hardness also results into the possible formation of holes or spots in the paper. The overall efficiency of cationic process chemicals also decreases, as well as the strength properties; the energy needs for refining increase and dewatering becomes slower. Figure 4. Acidification of DIP (12%). The graph shows the relation between a strong acid and CO2. 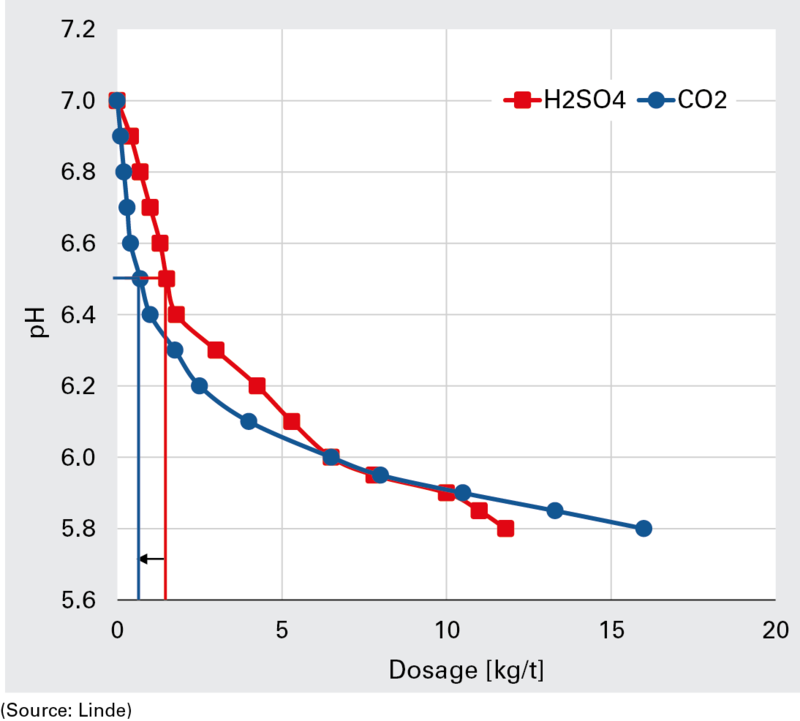 According to Jansson, carbon dioxide is more efficient than strong acids at higher pH and less efficient at lower pH when neutralising “clean“ water. «But when solid CaCO3 is present, this does not hold true: the reason is that dissolution of calcium carbonate causes pH to rise and thus more acid is needed to reach the desired value. 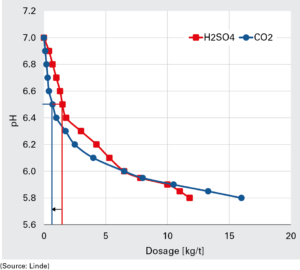 Carbon dioxide causes less or no dissolution of CaCO3 than strong acid, and thus is more efficient», said Jansson.